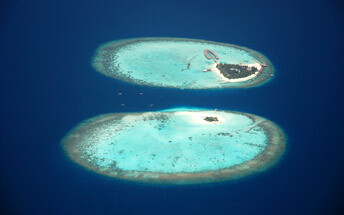 Club Faru is located in the North Male’ atoll, near Male, the capital of the Maldives. People who plan their visit here tend to think: I am going to get bored, staying a few weeks on such a tiny island. Once you set your foot on any island, these fears seem to disappear miraculously. Club Faru is a very active all inclusive resort in the Maldives. You can go diving, swimming in the pool, surfing, sailing, cat-sailing, kayaking and more. The island also offers badminton, beach volley, a huge lot of interesting excursions, for example a visit of the worlds smallest capital Male, a round flight by Maldivian Air Taxi, and so on. Actually there is no reason why anybody could ever feel inactive. Farukolhufushi started as a resort in 1978 and was formerly known as Club Med. This spectacular property is situated in the North Male atoll, close proximity to the International Airport and capital Male. The transfer time by speed boat is only about 7 minutes to the resort. An all Inclusive resort with caring staff that warmly treats you as family. The Island is approximately 1200 meters in length and and measures 450 meters as the widest point and is fully covered with lush tropical green vegetation and sheltered with hundreds of coconut-palm trees. The resort is perfect to stretch out and soak up the sun on the beach or laze around the outdoor fresh water swimming pool. Club Faru, Farukolhufushi offers 152 guest rooms in two-story blocks designed and laid out to blend with the natural beauty of the island. All rooms are just a few meters away from the white sandy beach and have the stunning view of the crystal clear waters. Twin rooms sleep up to 3 adults or 2 adults and 1 child (3rd bed is camp bed) with private bathroom with shower, air conditioning, telephone and balcony or terrace.